The UK and US economies are stagnating whilst much of the euro-zone economies are in the grips of an economic death spiral of ever greater economic austerity in response to ever increasing debt to GDP ratios as economies contract. The solution as far as the west is concerned has been one of printing money (electronically) to monetize government debt via the bailed out banks which is highly inflationary as the money printing is not backed by any real economic activity and hence continues to drive an exponential inflation mega-trend resulting in real terms loss of purchasing power for all workers and savers. One of the solutions I put forward over 2.5 years ago, before the 2010 UK General Election was to boost the real economy of small businesses via loans and investments in real enterprises that actually have profit generating business models rather than what we see today which is QE for the banks and government deficit spending on socialist public sector black holes. In this respect over 2 years later the Lib Dems as part of an improbable coalition government finally announced Cables Business Bank that they had signaled in their pre-election manifesto. Though the £1 billion is a mere drop in the ocean compared to the estimated £100 billion that would be needed. £1 billion will only help about 10,000 small businesses, £100 billion would help as many as 1 million and make a huge difference to the British economy and really could ignite sustainable economic recovery that I am sure many other countries would seek to emulate, and yes it would be sowing the seeds of the next bubble because it would still be a form of socialism, but it would be better then shoveling hundreds of billions into unproductive public sector black holes for which the spiral is endless and downwards, because true sustainable economic recovery only follows when the slate has been wiped clean! When the bankrupt have been allowed to go bankrupt be they small corporations, banks or even whole countries. Providing tax payer funds to small businesses is far from being a perfect solution and does not get to the heart of the matter which is the ever building cash mountains of large UK corporations of more than £750 billion (growing at about £70 billion per year), well beyond anything needed to spark an economic boom. Therefore the solution clearly lies in forcing corporations to re-invest this ever growing cash mountain that acts to drain money out of the real economy. In my opinion, the government should force corporations to either Invest their cash mountains (profits) or buy government bonds. This could be done by charging a punitive annual tax rate on all cash and bond holdings other than government bonds. This would increasingly prompt corporations to engage in competitive investments as they increasingly see their competitors increasing investment and thus market share. The more investments corporations make then the greater will be the amount of money injected into the real economy thus boosting employment, consumption, revenues, profits and taxes. Similarly the impact of corporations being forced to buy government bonds would force the yields lower for UK government bonds thus making savings a less viable option. To counter corporations just paying out the whole of annual profits as dividends to avoid re-investing or into buying government bonds. The percentage of profits that can be paid out as dividends could be capped at the yield on the 10 year government bonds (currently about 2%). This mechanism would ensure that at times of economic weakness when interest rates are at their lowest, corporations would be forced into maximum investment rather than accumulating cash mountains. Either that or be forced to finance government deficit spending. 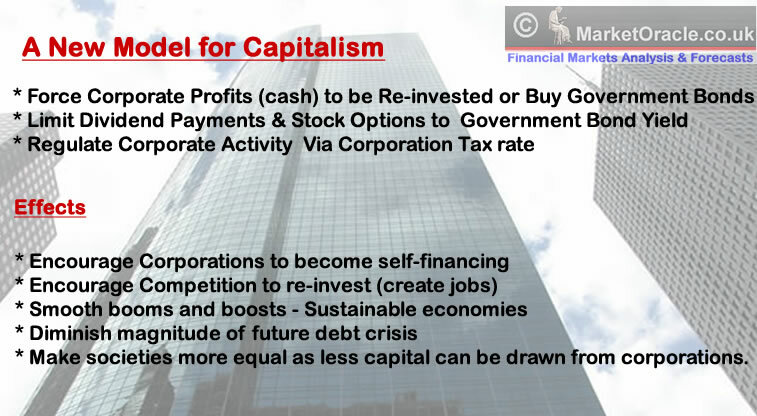 However as mentioned already this encouragement to invest would be built into the economic model as corporations would seek advantage by acting ahead of their competitors, thus act as a self fulfilling prophecy of corporations investing before their competitors invest, thus it would become natural for corporations during times of economic weakness NOT to drain the economy of cash. Leaving aside the fraud that many international corporations engage in where they transfer profits abroad so as to avoid corporation tax in the UK which requires Government action. UK corporations generate annual profits of approx £150 billion per year, of which dividends would be capped at just 2%, therefore leaving more than £100 billion after corporation tax for investment or financing of government borrowing, more than enough to induce economic recovery as it's real economic impact via the velocity of money would be many times greater. An opposite mechanism could exist for at the height of economic booms where corporations would be encouraged to save more and pay more out in dividends rather than to invest into what would later turn into boom time malinvestments during the subsequent slump. Thus discourage speculative investment at times of economic boom and thus make the economic boom more sustainable and corporate finances more robust during the following recession. However I do not see how such a policy would emerge from within a Tory government or a Tory Lib-dem Coalition, or even a Tony Blair-esk New labour government. This really would require a new third way, not socialism, nor free market capitalism but a form of state managed capitalism with corporations operating within strict boundaries of what they could do with their profits in terms of investing, dividends and cash accumulation during times of recession and booms so as to smooth out both towards a more sustainable outcome. This new third way would result in greater equality as the amount of wealth that can be drained from the economy by the rich (2%) would be capped (dividends) as a greater proportion of wealth is reinvested into the economy (employment). In fact this could have the genesis of sparking the political revolution that the occupy movement has long sought, i.e. it would manifest their desires into an sustainable economic model rather than the pointless slogans of taxing the rich into oblivion instead this could encourage investment and capital growth against drawing capital out of companies (dividends). This economic model could further be tweaked to close the various loop holes that would exist such as stock options as they would all fall under the income (dividend) banner and thus be capped at a maximum of 2% (Government Bond Yield). 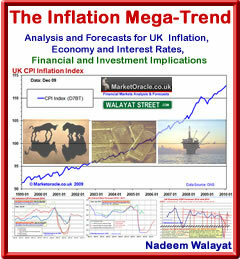 As this would be real money deployed in real investments rather than artificial central bank money printing government black hole spending, then it would not be inflationary, for investments would increase productivity and thus would have a good deflationary effect. So the economy would grow with little inflation as the growth would be based on real economic activity rather than debt fuelled growth. End of Future Debt Crisis. This economic policy over time would increasingly make the banks redundant as it would encourage a culture of corporations to become self-financing by saving at times of booms and re-investing at times of economic weakness, thus the risk of future debt crisis would be greatly diminished due to reduced debt exposure. Similarly the impact on the Banking Sector would be that they would be very limited to the amount that can be paid out in bonuses to 2% (govt bond yield) of profits, thus result in a change in business models. Instead of regulating the whole economy via interest rates, this economic model would increasingly see the economy split in the regulation of the economy with corporations by corporation tax rates, whilst consumers would continue to be regulated by interest rates. Therefore the government would be better able to target it's response to inflation or dis-inflation on corporate's or consumers.